Free WAVMA Webinar on removing fish tumours – by Dr Van de Sompel. Join us on October 4, 2016 at 13:00 CEST (European Central Summer Time/Brussels, 11:00 GMT/UTC) for this free webinar (see in your local time zone). About this webinar: This presentation will cover veterinary procedures for removing skin and internal tumours or pseudo-tumours, on or in Koi, including patient preparation, surgery and post-surgical hospitalisation. 3. Surgical removal of tumours. About the speaker: Dr Van de Sompel graduated in 1990 as a veterinary surgeon, with honours, from the University of Ghent. As part of a family veterinary practice with her husband that focuses on small (companion) animals, pigeons and other birds, and fish, she is the primary veterinarian who deals with fish patients on a daily basis. Typical cases seen involve ornamental fish, or consulting with sustainable aquaculture farms, including koi, other carp, sturgeons and various aquarium fish, and occasionally turtles. Watch some of her work here. This webinar is suitable for veterinarians, vet techs/nurses, vet students and veterinary practice staff. Interested but can’t join the live webinar? If you register for the live webinar and are unable to attend, you will be e-mailed a link to view the webinar at a later time. 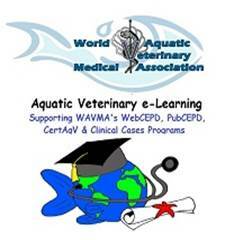 Discover more about theWorld Aquatic Veterinary Medical Association at www.WAVMA.org. Get listed in the on-line Directory of Aquatic Veterinarians and subscribe to AquaVetMed e-News by registering at www.AquaVetMed.info. Previous Post Hole in the head disease. It’s not what you think you know. Next Post Abalone necropsy (how to dissect abalone for laboratory testing).